My name is Jason and I am a Richmond supporter. If you think that sounds like the opening line of someone who is trying to confront an addiction, then you would be right. 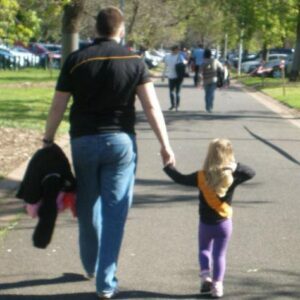 I have been a passionate Tigers fan since I attended my first game against Collingwood at the MCG with my dad in 1977. Walking away from the game on that winter’s day, something was stirred in my soul that has never left – in fact, it has consumed me for 40 years. Although my pop (on my mother’s side) and dad are Richmond supporters it was never pushed on me to support them. My connection with the Yellow and Black is difficult to explain, best summed up by an oft-used quote: “You don’t choose your football team. Your football team chooses you”. I was very fortunate to watch Richmond win a premiership as a nine-year-old in 1980 and then play again in a grand final in 1982. Since those glorious times, however, the majority of the next 35 years have been Yellow and Bleak; Richmond has been a punchline and not a powerhouse. Throughout this time I have been a walking cliché of a Richmond supporter; you know, the one whose eternal optimism peaks in early March with comments like, “this is the year that we make the finals and win the premiership” and “our newest top-10 draft pick should win the Brownlow Medal”. Can’t explain why… it’s just a feeling that I have. My daughter was born in September 2009 (62 days before we drafted Dustin Martin) and becoming a dad has allowed me to unashamedly pass my passion to the next generation and create a family bond and activity that is genuinely one of our favourite things in life. In addition to the fun of a day at the ‘G, just by witnessing her dad at a game, my daughter is getting a full education in human emotion: hope, optimism, excitement, concern, frustration, despair, elation, disbelief, anger and disappointment. And that was just Round 8 against Fremantle. True story. Despite recent September disappointments, the guttural roar that was collectively let out by myself and 70,000 other Richmond supporters after our qualifying final win against Geelong showed that 35 years of disappointment can turn to hope very quickly and that Richmond are a serious force in the AFL again. I really think 2017 is the year that we win the premiership and that Dusty should win the Brownlow.